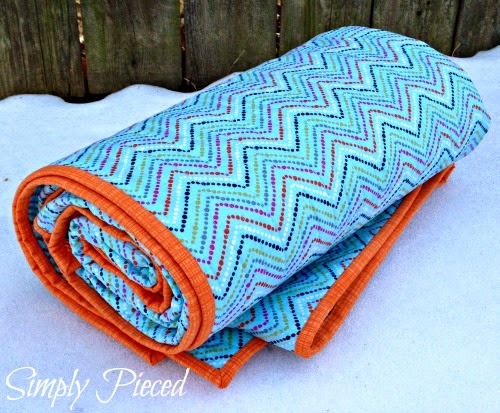 I've been giving quilts as gifts since the very first quilt I made back in 2011. I find a real joy in using my hands to put together a gift that comes directly from the heart. I know every piece of fabric in a quilt. I know every stitch. I know the joy of overcoming a challenging pattern, and I know the frustration of completely having to redo a section that just didn't come out right. In the end, I always have a quilt that was made with love for the intended recipient(s). There are always scraps left over when I finish a quilt. I try to be a good steward of the resources in my sewing room and not be wasteful. I save my scraps to be utilized at a later date. This scrappy flying geese quilt is really the culmination of all those gifted quilts made before it. I can look at each fabric and remember the story of its origin. I can see the babies that were born, the children that were adopted, and the couples whose weddings celebrated the beginning of a wonderful journey. I no longer see a simple piece of fabric, but a life story. I truly love how all these fabrics came together. I couldn't have asked for a better result considering I didn't have a plan when I initially started piecing everything together back in November. It's so bright and cheerful. It's also a simple flying geese pattern that gives off the impression of complexity with the use of all those scraps. For the back I found this fabric at Joann's that really complimented the front perfectly. I had some help from Kelly (My Quilt Infatuation) and Jenny, two fellow members of the Memphis Area MQG. I picked this sketched-orange fabric for the binding to add a pop to the quilt. It blends in nicely with the front but really pops on the back. When I started making this quilt, it didn't have a purpose other than to be just another quilt to snuggle under. A few weeks ago, I was approached by my best friend, Camille, to make a quilt to help raise money for an international adoption by a local Memphis-area woman who wants desperately to grow her family and bring her new 9-year-old daughter home from Central America. I knew this quilt, a collection of life celebrations, was perfect in welcoming home a child into a new home. I have personally seen the wonderful world of adoption through Camille, the aforementioned best friend. She has adopted 5 children into her family, ranging from newborn babies to fully grown teenagers. Her heart is bigger than most, and she doesn't hesitate to reach out and help others in their own adoption journey. The chance to win this quilt requires only a $25 donation. You can read in more detail about the fundraiser on Camille's blog, Embracing the Odyssey. She has links on her page where you can make a donation and also learn more about the family you will be helping. Every little bit helps and brings this family that much closer to being together at last. Or visit Kellie’s You Caring page and use your credit card to donate there. Of course, if you’re feeling exceedingly generous (or just really have a thing for quilts), please feel free to contact Camille at cclebel@gmail.com for details on how to make a larger, tax-deductible donation. 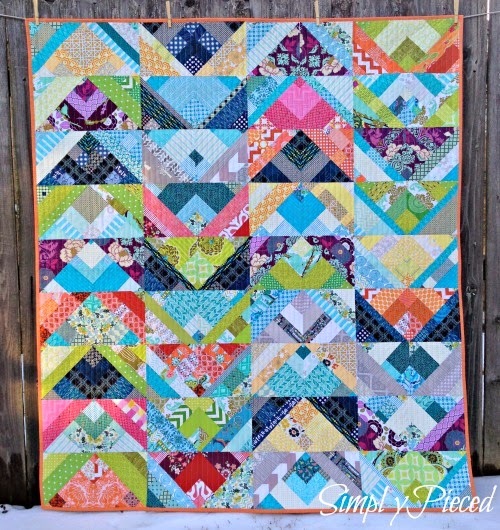 What a wonderful, modern scrappy quilt! Beautiful quilt for a beautiful cause! What a beautiful quilt - the memories behind it are precious - and wow, what a wonderful cause to support with it. I hope it is loved, spreads love, and helps the family going through the adoption process. This is a beautiful quilt. I'm so glad it's going toward such a good cause. I'm sure whoever wins it will love it, and that your donation will be a blessing to the family. Love this quilt! The design is so cool and the colors are great! Wow, what a quilt! I think some of the best quilts come out of the scrap bin. I am so happy you shared it with Oh Scrap! Janet this is a fabulous quilt. a lovely story too! Exciting design, love scrappy and this the best. What a dynamic interpretation of a flying geese pattern! I love how the orange binding plays with both the front and backing fabrics. Hi Janet, I'm visiting from Freemotion by the River. Your quilt is beautiful and even more so because of the cause you are donating it to. I have enjoyed reading your blog - I've been browsing for a few minutes now! Loved your mini quilt for pin keeping too. What a beautiful quilt! It really is a fun way to transform a flying geese unit. I'm glad that it will be going for a good cause. It's always nice to see kindness in the world! what a lovely quilt and lovely story. Do you have a pattern or tutorial for how you made the blocks? never mind! I just read your first post you liked above! Fabulous - it is gorgeous and cheery! As an adoptee myself I am so thankful for people like Camille and my parents who have such huge hearts and are willing to share them! Your words are even more beautiful than this wonderful quilt Janet! I have goosebumps on my arms and tears in my eyes. The quilt is gorgeous and I love the backing you found! That is such a great quilt - and anything with scraps is always a hit in my book. The backing is so spot on and such a great cause too. What a wonderful quilt and such an inspiring story! What a special quilt. It is beautiful and you have dedicated it to a great cause. This is a beauty. I don't think I've encountered a scrappier flying geese quilt. I'm sure the lucky winner will adore it! What a beautiful quilt and wonderful cause! oh my goodness!! This quilt turned out so be SO stunning, Janet, and for such a worthy cause. Love it! !